Sacnoth is an industrial world with a tainted atmosphere. The system has a population over one billion. It is a member of Sword Worlds Confederation in the Sword Worlds Subsector of Spinward Marches Sector and in the Sword Worlds. This world has a nearby Sword Worlds Naval Base for support of military starships. This world supports a Sword Worlds Military Base for military ground forces. Sacnoth is an industrial world with a tainted atmosphere. The system has a population over one billion. The world serves as the capital for the subsector. Government control of this world is by an external military force. This world designated as an Amber Zone. Caution is advised since the world has an environment, laws, customs, life forms, or other conditions that are not well understood and might be a danger to a visitor. It is a member of Regency of Deneb in the Sword Worlds Subsector of Spinward Marches Sector. This world is an Interface world, with a quarantine inspection facility for all ships.It also has a nearby Regency Naval Base, capable of handling warships. Sacnoth has a normal climate and a standard oxygen-nitrogen atmosphere with a taint of unknown composition. The concentration of this substance, which is thought to cause cancers and other serious ailments in humans, varies in an unpredictable manner that has not yet been matched to any detectable phenomenon. The Sacnoth system contains two stars: the primary Leothic and its companion, Tharagavverug. Sacnoth orbits at a distance of 1.80 AU and has two large moons. The planet has three continents, all joined by isthmuses. The largest continent, Eisufur, covers the the north pole and a third of the continent south past the equator to the 30th parallel. The continent Arathrion is approximately half the size of Eisufur but occupies a similar position in the southern hemisphere. The smallest continent, Erl, runs around a third of the planet between the 40th and 60th South latitude. The lake region of Erl, around the large inland sea of Harmeer, is the most heavily populated area of the planet and contains the capital city of Foerstaberg. Sacnoth's starport, Istrakhan, is located off the western coast of Erl on the Halsband Islands in the Das Central Meer ocean. Sacnoth was originally settled by dissidents from Gram (world) in -294 and has since played an important role in the history of the Sword Worlds, often vying with Gram for leadership. Sacnoth was the capital seat of the Sacnoth Dominate which was founded in -186 and was the first interstellar government among the Sword Worlds. The Sacnoth Dominate disintegrated in -102, a casualty of the War of the First Rebellion, one of several internal conflicts with Gram. 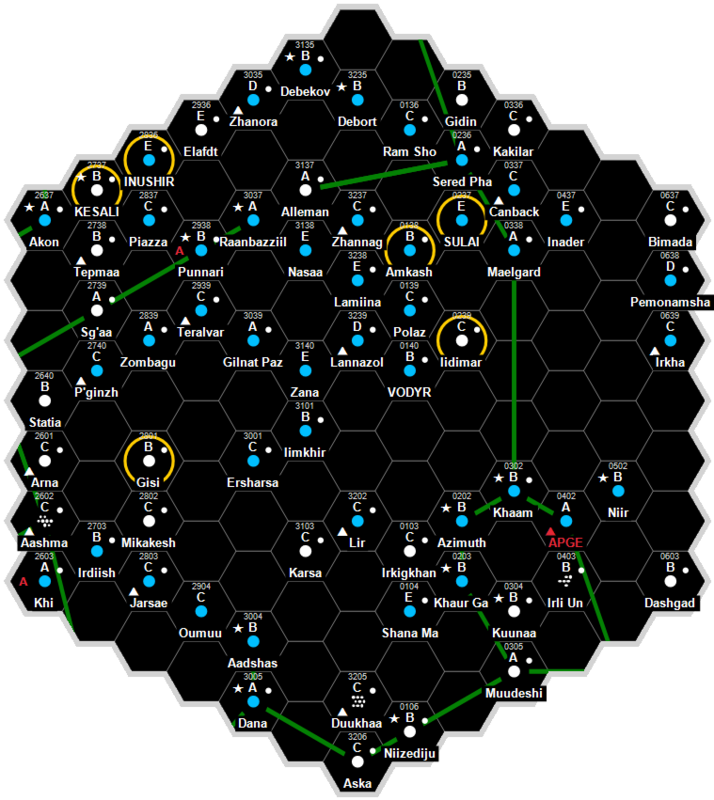 The Dominate fractured into several smaller governments, including the Sacnoth Confederacy, though none of these governments lasted long and within 25 years no interstellar government existed in the Sword Worlds and most trade ended for nearly 50 years after. The Gram-Sacnoth War was waged from 98 to 104 and resulted in a stalemate; other Sword Worlds states moved in to balkanize Sacnoth and Gram, which had both been exhausted by the conflict. Sacnoth remained weak and divided until the Federated States of Sacnoth were formed in 364, once again unifying the planet. In 537 the Sacnoth Alliance was formed between Sacnoth and the Double Monarchy. In 604 the Sacnoth Dominate was reestablished as the Second Dominate, which lasted until 698 when it was overthrown by the Gram Coalition. The Gram coalition ruled until overthrown by the Trilateral Alliance, which included Sacnoth. The Trilateral Alliance ruled from 788-848, and dissolved into another period of interstellar anarchy which persisted until the current Sword Worlds government was founded in 852. During the Fifth Frontier War Sacnoth raised and commanded one of the four naval fleets controlled by the Sword Worlds. The Sacnoth Fleet was assigned to guard the rim-trailing border of the Confederation, which includes the resource rich and uninhabited Metal Worlds. The Sacnoth Fleet was subsequently destroyed by the Imperial 214th Fleet in a decisive battle at Sting (world) on 016-1110. Following the War Sacnoth seceded from the Sword Worlds Confederation to join the Imperial Client state known as the Border Worlds Confederation. This was a great loss to the Sword Worlds. After a shaky start, the population settled well under Imperial rule and Sacnoth was the first of the Border Worlds to be granted home rule, in 1114. Defense is handled mainly by local forces, though an Imperial Navy squadron is based on a moon of the gas giant Falka. Non-canon: Sacnoth had been a severely xenophobic world, even for a Sword World. Visitors to the world were confined to a large reservation around the Downport, and were not permitted to pass beyond its periphery. The Regency unwisely and cavalierly did away with this arrangement after the Landgrab, and the world has been rent with intercommunal violence ever since. Sacnoth had been severly factionalized to begin with, and the Regency's brazen actions (at least in their view) and immigration set off a severe backlash. Several large regions are unsafe even for the Regency military to visit, and are interdicted. Marc Miller. The Spinward Marches Campaign (Game Designers Workshop, 1985), . Dave Nilsen. The Regency Sourcebook (Game Designers Workshop, 1995), 45. Martin Dougherty, Neil Frier. Behind the Claw (Steve Jackson Games, 1998), 70. This page was last modified on 18 June 2016, at 18:50.